These psyllids cause colourful spherical galls, sometimes called 'apple' galls to form on gum tree leaves. Adult psyllids are small, sap-sucking insects about 2mm long, with two pairs of wings held roof-like over the body. 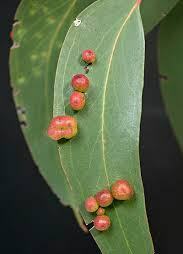 Females insert their eggs into the leaf tissue and galls begin to form as a reaction to the egg-laying. 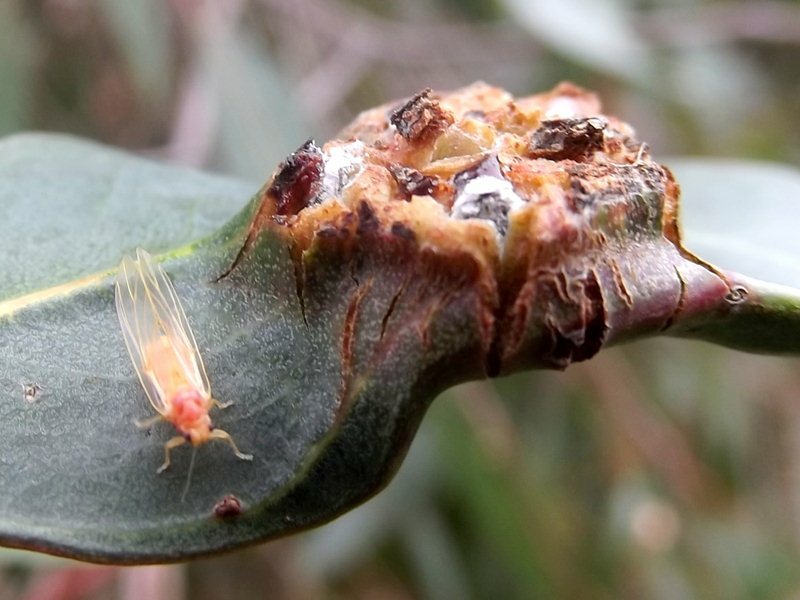 The eggs hatch into psyllid nymphs, which begin feeding inside the gall. As the numphs grow, so do the galls. Pictured above is the gall erupting with winged adults emerging. Prevention - not really necessary as a few lumps and bumps are perfectly normal on gum trees. If they bother you they can be picked or pruned off. Natural enemies are parasitic wasps.